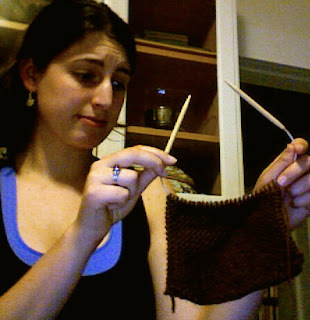 Kim's Kitchen Sink: Random Thing of Interest...and Knitting! Random Thing of Interest...and Knitting! These things could not be more unrelated, but here goes anyway. My friend Josh is currently on an Adventure in Thailand. He, being the morbid, sarcastic, zombie-loving, nerdtastic (lovable) freakshow that he is, wanted to go to someplace he had heard of called the Human Bakery. Check out his latest blog post for more information. Quite interesting indeed. Linked to said blog post, however, was the Japanese Banquet of Cannibalism. It may be one of the most disturbing things I've heard about. Ever. Although it's not as bad as it sounds. Really. Check it out. Josh, being a pre-med (and as I said before, a zombie-lover), would probably love to eat her. erm, here. editor's note: Josh is not a pre-med. He is a "full blown med" now. my bad. I have begun to work on my bag. Must rip out what I've done to re-size it. See how tiny it is? That's the base of the bag. And when I felt it, it will be about 1/2 the size it is now. Even tinier. Not so good for holding my lunch; and let's face it, I like to eat. You are, like, the ULTIMATE knitter. The rest of this is unrelated to knitting but: my Mom actually asked about you a few days ago. She said, "Who's your friend Kim? Tell me about her." And now she checks your blog regularly. i'm so excited to see it all finished!